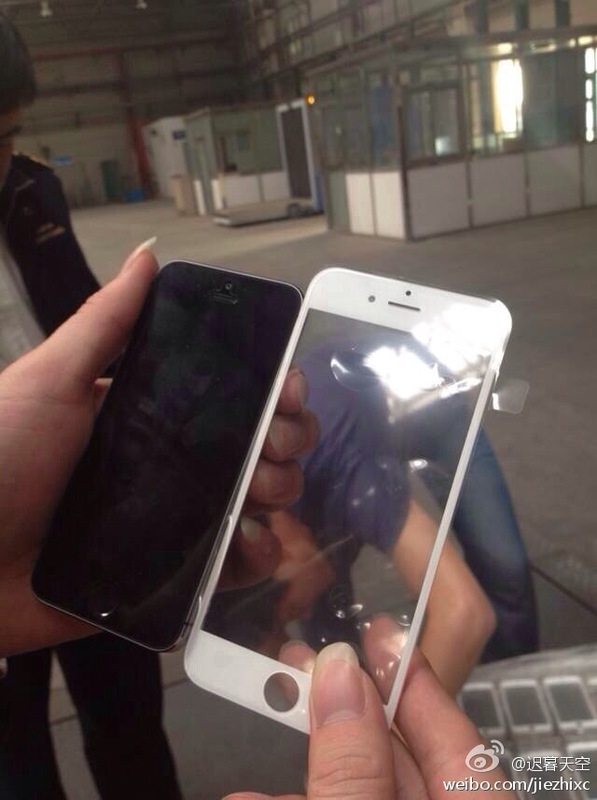 Could This Be The Front Panel For Apple’s iPhone 6? The image of what appears to be an iPhone 6 front panel was posted to the Chinese microblogging website Sina Weibo on Tuesday. Though we’re of course unsure of the legitimacy of the photograph, this could be our first real glimpse of how Apple’s upcoming iPhone 6 handset will look. First spotted by iPhone.fr, the image (above) shows a purported iPhone 6 front panel positioned alongside an iPhone 5 or iPhone 5s handset. As you can see, the iPhone 6 front panel indicates that the forthcoming smartphone will indeed be a larger handset, as anticipated. Besides the expected thinner bezels, the iPhone 6 front panel also suggests that the handset will simply increase the dimensions of Apple’s handset while preserving the usual positioning for the Home button, front-facing camera, proximity sensor, and ear speaker. We’re not sure of the handset’s precise size, however recent reports have argued that both 4.7-inch and 5.5-inch iPhones are expected to launch from Apple later this year. Most recently, we’ve seen purported iPhone 6 cases and drawings surface online, and a recent survey demonstrated that around 40 percent of iPhone owners are expected to upgrade to the new handset. Price could prove to be a stumbling block, however, since another recent report argued that the iPhone 6 could cost an additional $100 per handset. Apple’s next-generation iPhones are expected to reach the market in September or October this year. We’ll keep you updated with further information as we receive it. In the meantime, see: Apple’s iTunes Radio Makes An Appearance In Ecuador, LG Once Again Rumored To Be The Sole Supplier Of Flexible iWatch Displays, and AppAdvice International: Britain’s 4G Market, Apple’s EU Headquarters.